Montefiore Health System has deployed a data analytics platform running on these new Intel® Xeon® processors, a solution that analyzes varied and vast amounts of raw data in near-real time to help clinicians identify optimal treatment plans for patients. The solution provides a breadth of data management technologies including Franz AllegroGraph's Semantic Data Lake, predictive analytics, machine learning, and more. AllegroGraph allows Montefiore to extract sophisticated decision insights and predictive analytics from highly complex, distributed data in a way that is not possible using conventional databases. These predictive analytics are making big data more meaningful. 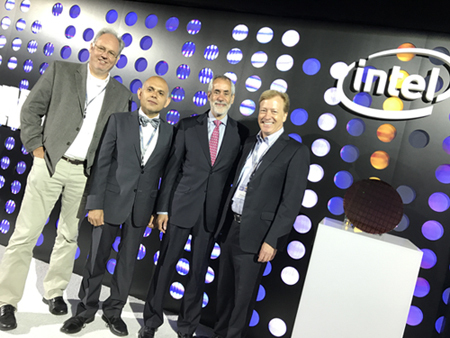 Franz CEO Dr. Jans Aasman, and Dr. Parsa Mirhaji, director of Clinical Research Informatics at Montefiore and the Albert Einstein College of Medicine joined Intel at their product launch event. Intel has released a Healthcare and Life Sciences Data Analytics Solutions Brief: Montefiore Creates Data Analytics Platform to Advance Patient Care. Watch this video to discover more about how Montefiore/Einstein has approached the challenge of turning its data into high-value insight through advanced analytics. Montefiore Health System consists of eleven hospitals; a primary and specialty care network of more than 180 locations across Westchester County, the lower Hudson Valley and the Bronx; an extended care facility; the Montefiore School of Nursing, and the Albert Einstein College of Medicine. Intel Corporation is an American multinational corporation and technology company headquartered in Silicon Valley that was founded by Gordon Moore (of Moore's law fame) and Robert Noyce. It is the world's largest and highest valued semiconductor chip makers based on revenue, and is the inventor of the x86 series of microprocessors: the processors found in most personal computers.